For the last decade we’ve obsessed over building great maps for our users—maps that are totally comprehensive (we’re shooting for literally the whole world), ever more accurate and incredibly easy to navigate. It’s a pretty limited search engine that only draws from a subset of sources. In the same way, it’s not much of a map that leaves you stranded the moment you step off the highway or visit a new country. Over the last few years we’ve been building a comprehensive base map of the entire globe—based on public and commercial data, imagery from every level (satellite, aerial and street level) and the collective knowledge of our millions of users. 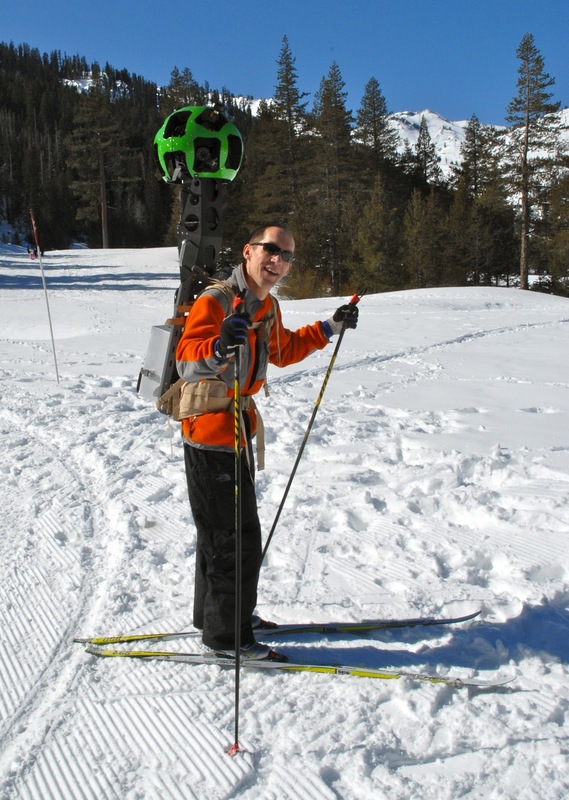 Today, we’re taking another step forward with our Street View Trekker. You’ve seen our cars, trikes, snowmobiles and trolleys—but wheels only get you so far. There’s a whole wilderness out there that is only accessible by foot. Trekker solves that problem by enabling us to photograph beautiful places such as the Grand Canyon so anyone can explore them. All the equipment fits in this one backpack, and we’ve already taken it out on the slopes. The next attribute map makers obsess over is accuracy. We still have a way to go because the world is constantly changing—with new houses, cities and parks appearing all the time—it’s a never ending job. But by cross-checking the data we have, we can significantly improve the accuracy of our maps. Turns out our users are as passionate about the quality of Google Maps as we are, and they give us great feedback on where we can do better. We make thousands of edits a day based on user feedback through our Report a Problem tool and via Map Maker, which we launched in 2008. Today we’re announcing the expansion of Map Maker to South Africa and Egypt, and to 10 more countries in the next few weeks: Australia, Austria, Belgium, Denmark, Finland, Liechtenstein, Luxembourg, New Zealand, Norway and Switzerland. The final element of the perfect map is usability. It’s hard to remember what digital maps were like before Google Maps went live in 2005, and the huge technological breakthroughs that transformed clicking on arrows and waiting, to simply dragging a map with a mouse and watching it render smoothly and quickly. Plus, we added one single search box. Today we have thousands of data sources that feed into our maps making them a rich and interactive experience on any device—from driving directions to transit and indoor maps to restaurant reviews. People have been asking for the ability to use our maps offline on their mobile phones. So today we’re announcing that offline Google Maps for Android are coming in the next few weeks. Users will be able to take maps offline from more than 100 countries. This means that the next time you are on the subway, or don’t have a data connection, you can still use our maps. An important next step in improving all of these areas—comprehensiveness, accuracy, and usability of our maps—is the ability to model the world in 3D. Since 2006, we’ve had textured 3D buildings in Google Earth, and today we are excited to announce that we will begin adding 3D models to entire metropolitan areas to Google Earth on mobile devices. This is possible thanks to a combination of our new imagery rendering techniques and computer vision that let us automatically create 3D cityscapes, complete with buildings, terrain and even landscaping, from 45-degree aerial imagery. By the end of the year we aim to have 3D coverage for metropolitan areas with a combined population of 300 million people. I have been working on mapping technology most of my life. We’ve made more progress, more quickly as an industry than I ever imagined possible. And we expect innovation to speed-up even more over the next few years. While we may never create the perfect map … we’re going to get much, much closer than we are today. One of the most powerful features of Google Earth is the ability to view custom maps or overlays, which are also commonly known as KML files. 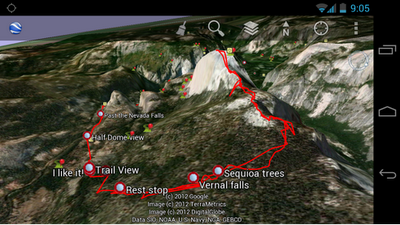 Ever since we introduced Google Earth on mobile devices, users have requested support for custom content. 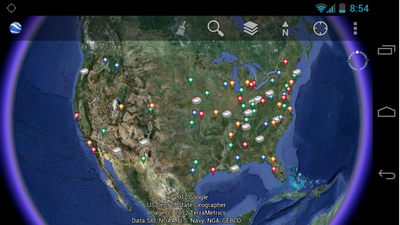 Today, we are proud to announce Google Earth 6.2 for Android and iOS, which includes support for KMLs. Now anywhere you find a “Google Earth file” (KML file) while you’re browsing the mobile web, just click on the link and the Google Earth app will automatically launch and load the custom map. With this release, the Google Earth Gallery is also now available in the mobile app, enabling you to easily explore some of the best maps from around the web directly within Google Earth. For example, not sure if that was an earthquake? 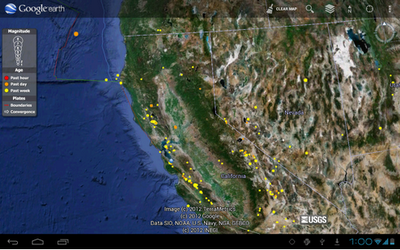 Go to the Earth Gallery and click on the USGS’ real-time earthquake map to see recent earthquakes from around the world. Maybe you’re interested in finding hiking trails on your next vacation. Check out Everytrail to find a hike wherever you might be. If you’re a basketball fan, be sure to check out the new College Basketball Tournament map, which takes you on a virtual trip to the school and stadiums of this year’s competing teams. For Google Earth for Android users, we’ve also added a new “Share” feature, which allows you to share a screenshot of your current view with people in your Google+ circles, via Gmail, or on other applications. Now you can share your favorite places with friends and family from your desktop computer, mobile phone or tablet. And, if you follow the Google Earth +Page, you can see what others are sharing and discover new locations around the world. The 6.2 release of Google Earth for Android and iOS also includes improvements in navigation, which make it even easier to fly to your favorite spots on the globe. To check out the latest version of Google Earth for Android phones and tablets, download it now from Google Play.